The crayon craft we did today started as a research project. I was looking for a way to recycle or reuse a very old muffin tin. Not only did I find a craft for reusing my worn tray, I was able to make use of our collection of broken crayons. My kids enjoyed the fun and learned that it was an earth friendly activity, each in their own age appropriate way. But, you may need to experiment a little. . . In my first attempt to make crayon doodlers I used instructions that left out the freezer part and suggested lining the muffin tray with tinfoil. This didn’t really work, because some of the wax got out and coated the bottom. Instead of throwing out the muffin tin, I will reuse it next time. A sturdy multicoloured muffin crayon such as this would have been great for doodling in the car. The tinfoil failure was my daughter’s favourite part, though, because we reused it to make silver rings for her treasure box (where she keeps all things chokable away from her brother). Speaking of chokable, these homemade crayon doodlers are not safe for toddlers. They crack quite easily and pieces can break off. I learned the hard way because my son thought they were frisbees and flew a few through the air. For stronger crayons, fill the tins to at least half. Some moms complain that the colours all run together, but I found that if you remove the tray as gently as possible (or try using contrasting colour combos such as bright green and red) they work fine. By the way, the crayon paper I peeled off would have made great confetti for the homemade pinata we made for my husband’s birthday, which was filled with birthday messages from friends and family. I’ll save the colourful paper for our next fridge collage! What else could be done with these papers? « ZapRoot: BPA Declared Baby Safe, Thanks FDA! Great tip! I wondered if the freezer would make them less prone to cracking. Then again, it’s rarely mom who needs to be patient. Are they ready yet is always the question no matter what’s in the oven, isn’t it? Thanks for the book recommendation! 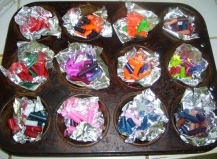 Not sure why I never thought of using a muffin tin… I melt them all down and pour into candy molds so we have fun shapes. The tins would be mush simpler since I HATE melting each color individually, it takes a long time. I always let our crayons just dry in the molds, I’ve never tried the freezer, but I would think it could increase the brittleness? Guess its experiment time! When I’ve done it I’ve put the muffin tin in a larger pan filled with water. Then I let them cool overnight. They were not as brittle as the ones I did with the freezer. This was important because I was making them for a Children’s Art Museum. We made both the multi color ones great for rubbings, and solid color ones. The solid color ones were great for kids wanting to do things like fill in the sky or color grass in their pictures. The primary purpose was for patrons with limited fine motor skills. They were able to grasp the bigger crayons and draw. Who knew there could be so many options for this simple craft? I wish I had more broken crayons now. I want to make some thicker ones for our road trip and I’d like to try the hands off approach Bev Bos suggests. We made some great art today by scribbling with all the colourful crayons and putting black on top and scratching out designs. My daughter was upset that her dad had cut her finger nails. Hi, I just found you on Hugg! What a great fun project, thanks for the instructions!